This post had a few glitches or at least one and that came at the end of the process. It’s a 1 quart “crock-ette!” Love the name. The sticker said $5 so that means I got it for $2.50!! Well, this little baby rode around in the back of my car for quite a while. Finally, I decided I needed to give it a try. I had gotten a lot of fruit in a basket for Christmas, mostly apples and pears. The apples were fine, but the pears were getting too ripe. This was a perfect job for the crock-ette. I pulled it out and wiped it all down. 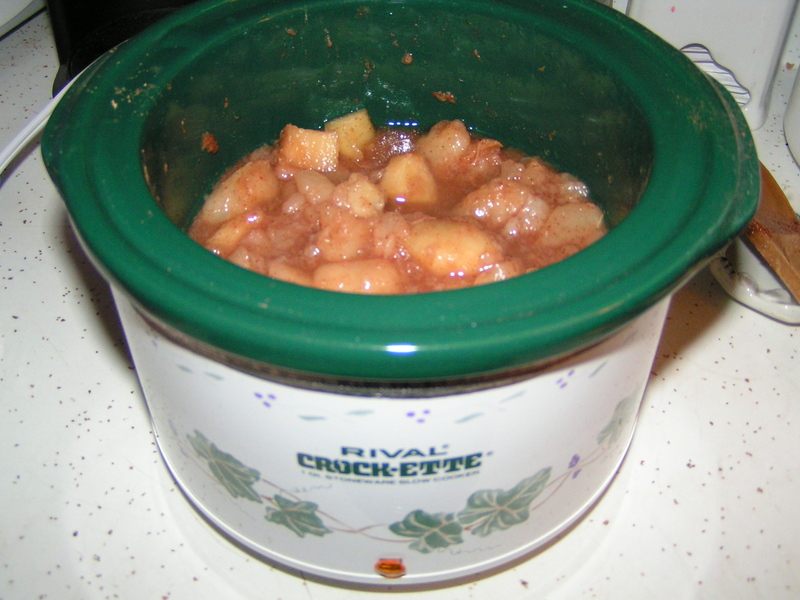 Usually this small type of crock pot does not have a removable crock. To my pleasant surprise, the crock IS removable! The smell was incredible and it even woke up Ralph! Next time I will adjust the spices, but overall, I love it! I put it in a container and stored it in the fridge. Tuesday morning I was ready to use little crock-ette again. 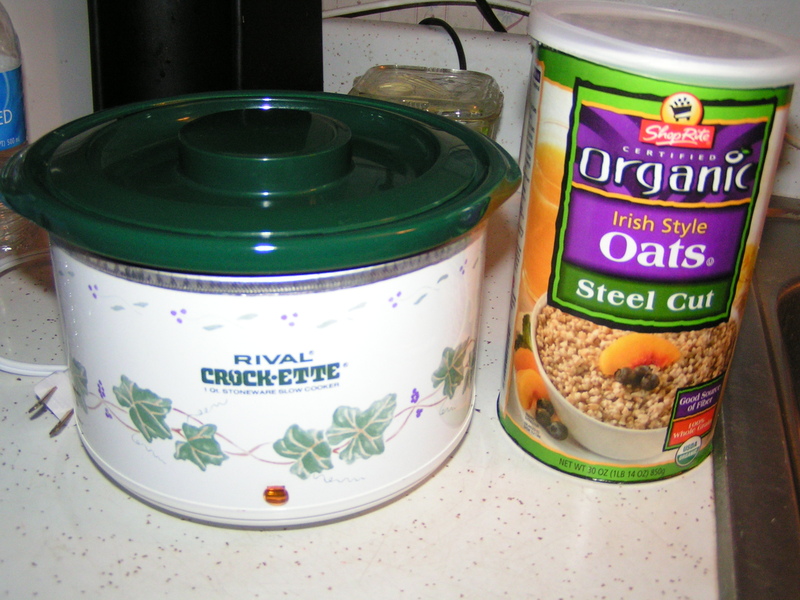 My friend Wendy from Weight Watchers had told me that she makes steel-cut oats in her little crock pot. I thought I’d give it a try. I’ve had a container of steel-cut oats for a while but haven’t used them because most people say you need to cook them stove top and I’m really more of a microwave girl lately. But I thought I’d give it a try! Wendy’s recipe calls for 1 cup of the steel-cut oats and 4 cups of water. It just fit! I stirred it up and let it go. Wendy had said that for her, 1 hour and 45 minutes was the perfect length of time to cook it. Well, I’ve said this before regarding using a crock pot…every one is different. I always explain that when I talk about cooking my beans. One hour and 45 minutes passed..2 hours and 45 minutes passed…on and on. I know that opening it slows the process, but I wanted to be sure it didn’t burn. Done!!! I was so excited. 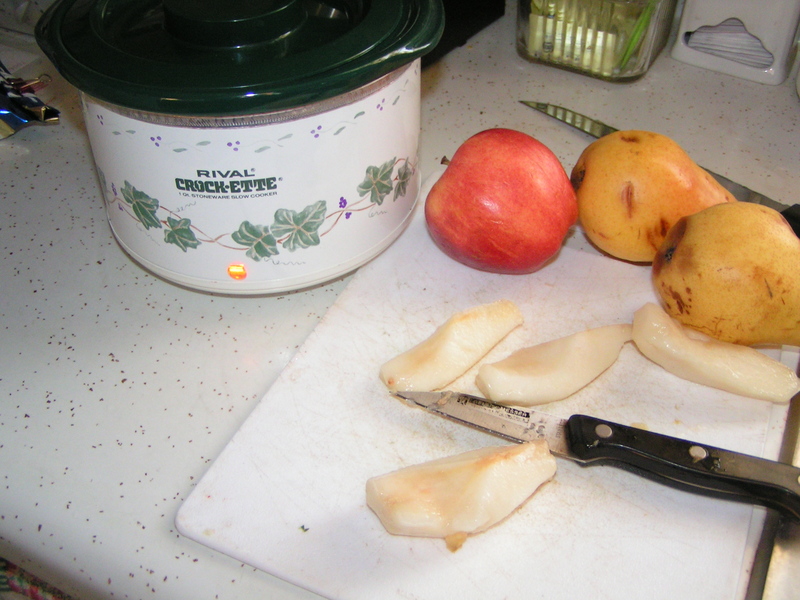 I pulled out my cooked pears and apples I had made the day before and warmed some in the microwave. Ta-Da!! It looks a little watery but that’s from the juice on the fruit. I tried, honestly I did to make this look all pretty and professional. But you know what? I don’t really care. It Tasted Good! Something I’ve learned since I started BCDC is that, it may look terrible, but if it tastes good…that’s all that counts. This was delicious. I learned some lessons with my little “crock-ette.” I’ll do some things differently next time and I’m already working on some other tasty things I can cook up in it. I love it when I can get good use out of something that I paid so little for! So that’s WIAW from my side of town. Not as much food as usual and I guess it really shouldn’t take 2 days to make 1 breakfast…acutally it will make 4 breakfasts because I had enough oats for a total of 4. Be sure to stop over at Peas & Crayons, look around and let everybody know how much you enjoyed reading about all of the wonderful food ideas. I’m going to go look up some more crock-ette recipes! This entry was posted in Uncategorized and tagged crock pot, oatmeal, WIAW. Bookmark the permalink. Hi Shannon. I have my one that about 3 quarts that I use for cooking my beans and some soup. I also splurged when there was a sale recently and got a 5 quart one that I hope to make chili and other mega meals in. Haven’t opened that little baby yet! that pear / apple concoction looks devine!! 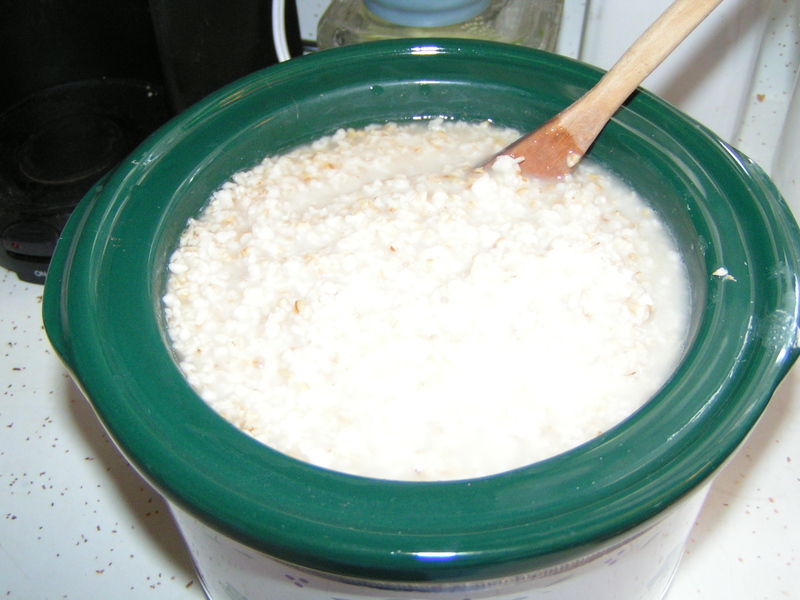 i used to use the slow cooker to make steel cut oats overnight. i don’t think it called for any more water… the 1-to-4 should still work, but i set it on low, and went to bed. there wasn’t much if any that was overly crusty… and then breakfast all week! Hi there! The pear/apple was SO easy. The oatmel was great, next time it’s an overnight for me! I love my mini crockpot!! I have a big on too. Slow cooked steel cut oats are the best! I don’t make them nearly enough! Tara, maybe we should start a crock pot Fan Club! I just love mine. That crock-pot is a steal! Amazing! What a great find! Crock-pots are so nice to have when you don’t feel like cooking, you just throw all the ingredients in the pot and wait! Hi Mattie! I’m so excited when I find a deal like that on a kitchen helper! Thanks, Jordan! They are delicious! I love pulling up to the thrift store and seeing the 50% off sign. My favorite one was just renovated and I hope they don’t up their prices. So excited for your cute little purchase. I bet your apple/pear combo smelled fabulous. Hi Marie! Yes, it smelled and tastes wonderful! I’m going to Florida next week and that is Thrift store Heaven! There’s a new one that was about to open when we were there last. Can’t wait to try it! Your pear compote looks divine! Also, crock-pots are the best! Hi there! I agree I LOVE crockpots!~! Life lesson–the uglier and messier a food/meal is, the better it tastes. Hand me a brownish-gray pot of curry lentils, and I will be a happy girl eating tasty messy goop! 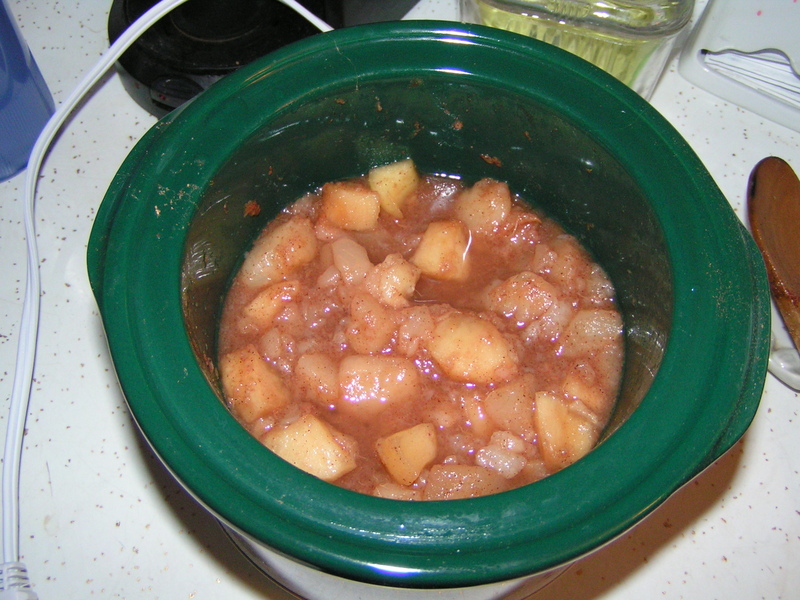 Can’t wait to see what else you come up with with the crockpot–I LOVE mine, don’t know what I’d do without it. I was thinking about cooking lentils in it Allie! You’re psychic!! I love lentils and don’t make them often enough. When I get home from Florida…lentils on the list!! I love lentils and make them way too often, haha. 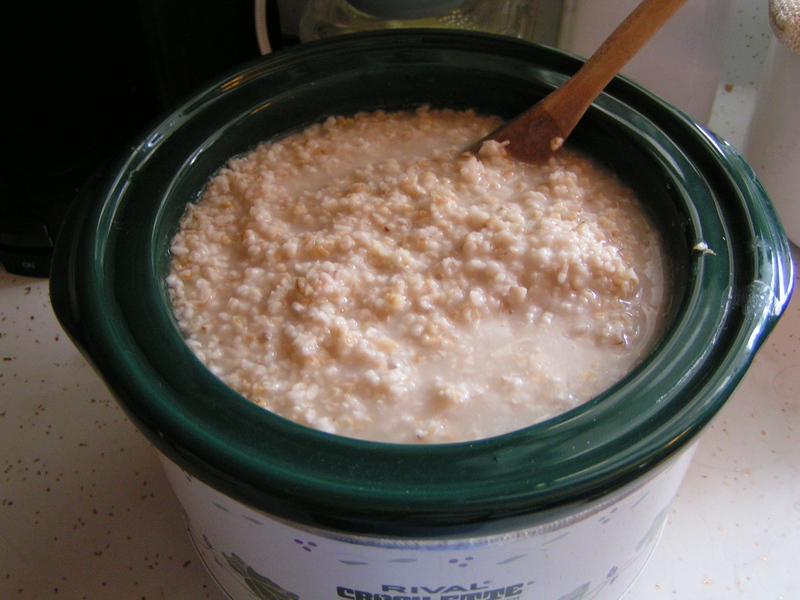 Oats in the slow cooker is on my to-try list, but I think I need to get a smaller crock pot for it. Time to scour the thrift stores! Allie, the little crock pot is so handy. Do you make your lentils in the crockpot? Yep, I always do my cooked lentils or beans in the crockpot, it means I don’t have to stand over the stove for an hour, and the lentils really soak up the flavors of whatever they are being cooked with! Great, Allie! I’m going to have to give that a try. My Gram instilled in Ele and Me a love of lentils when we were growing up! Love the crockette!!!! SO cute, I need to try and make oats on my cockpot or rice cooker soon! Hi Ashley! The oats are delicious and were even better when I warmed them this AM!! I’ve heard you can make them in the rice cooker too. I have one but haven’t opened it yet. I do that all the time!! Thanks for visiting…stop by often! I have no idea why but I cannot for the life of me make a meal in my crock pot! I always mess up the liquid ratio. Hi Ali! Thanks for visiting. The crock pot truly is an issue of trial and error! Everyone seems to work differently. As I mentioned in this post, for my friend it took an hour and 3/4. For me, it took 5 and 1/2 hours. Mine was perfect but took longer. My suggestion is to pick something you want to make. Use the time given as an approximation. Do it on a day when you can be around at the time it should be done and check it. It could be done sooner also. Keep in mind not to open it too often because each time you do it slows the process. That’s a mistake I always used to make. Pleas stop by again! Oatmeal never does look pretty Fran, but this does look quite tasty! I am impressed. Great idea. Happy 2012 my friend. Hope it’s off to a good start. Thanks, Ameena! So far, so good. Trying to be productive! Definitely worth the time it took to cook… looks delicious!! Hi Lisa! And the great thing is, I have got 4 breakfasts out of it. Just have to warm it up. I like easy! Happy WIAW! I totally need a crockpot! I have a rice cooker but I’m not sure that counts the same 😦 Boo! Hi Liz! I hear that you can cook oatmeal in a rice cooker. I do beans in my crock pot and I think you may be able to do them in the rice cooker too. 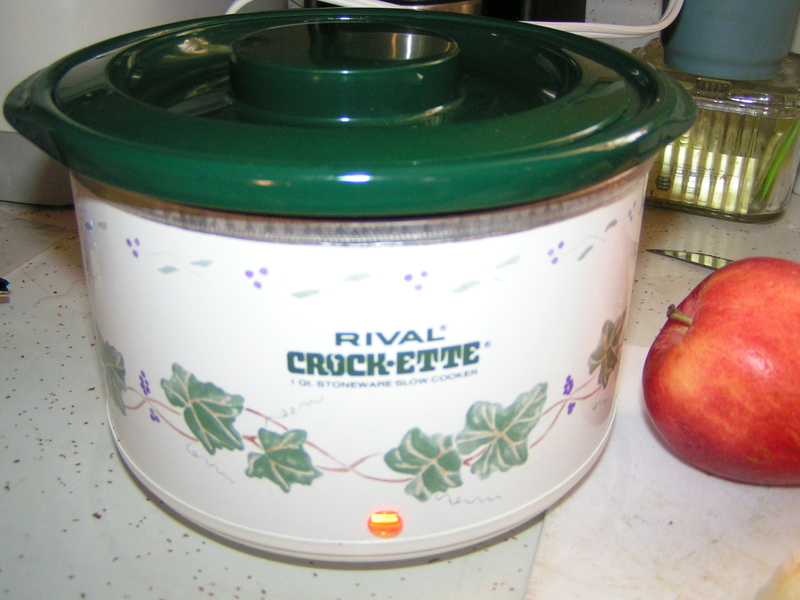 But I love my crock pot for soups and a baked bean recipe that I make. I think you need the crock pot for that. They’re so inexpensive even if you buy them new! The original that I have I’ve had for over 30 years and it works great! 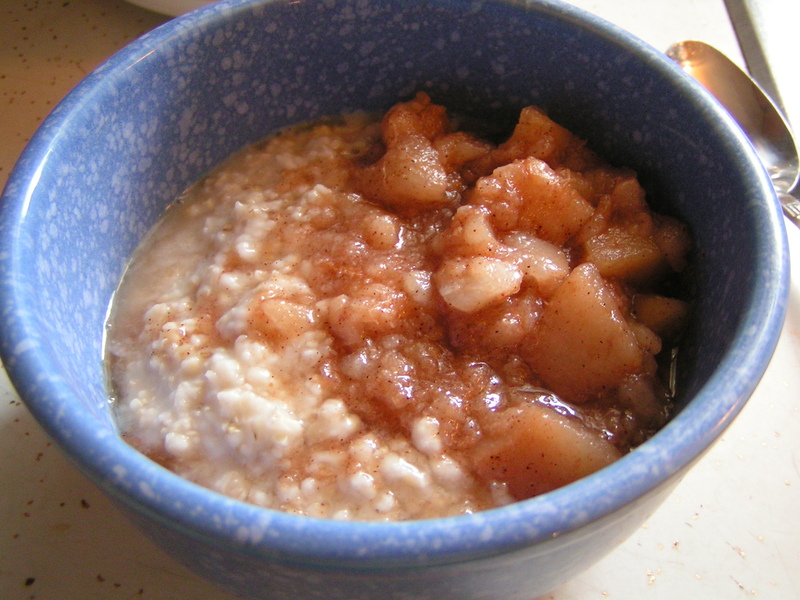 I love that mini pot – and porridge with spicy cooked apple and pear is such a winner! Eleanor you’re so funny! Yes, that’s what everybody is saying…it doesn’t have to look pretty to taste good!